The Guardian is reporting that "Ireland is bracing itself for Hurricane Ophelia with a red weather warning issued for the Republic and an amber warning issued for Northern Ireland. To underline the serious risk Ophelia poses to public safety, Met Éireann also warned that it could be as bad the 1961 Hurricane Debbie, the most powerful cyclone ever to hit Ireland, which caused 18 deaths." I'm a bit confused. 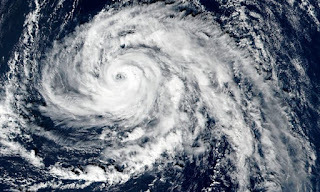 Hurricanes normally form in warmer waters. The Washington Post is reporting that "On Saturday, Hurricane Ophelia accomplished the unthinkable, attaining Category 3 strength farther east than any storm in recorded history. Racing north into colder waters, the storm has since weakened to Category 1, but it is set to hammer Ireland and the northern United Kingdom with damaging winds and torrential rain on Monday as a former hurricane." After Ireland it's due to hit Scotland and miss England. CNN is reporting that "Ophelia's position is the farthest east that a major hurricane has traveled in the Atlantic. The previous record was held by Hurricane Frances in 1980, according to CNN meteorologist Haley Brink. Frances formed off the northwest coast of Africa near Senegal, according to an archived National Hurricane Center report. Frances never made landfall." CNN is also reporting that "Ophelia weakened from a Category 3 to a Category 2 hurricane early Sunday, with sustained winds of 105 mph." It's a wild world so it is. Mind how ya go. Update: The Washington Post is reporting that "Former Hurricane Ophelia plowed into southern Ireland early Monday, unleashing wind gusts as high as 119 mph, ripping off roofs and downing trees. The Irish Meteorological Service said it could be the country’s strongest storm in 50 years." The BBC is reporting that "As hurricane-force gusts battered the Republic of Ireland, one woman and a man died in separate incidents when trees fell on their cars. A second man died in a chainsaw accident while attempting to remove a tree felled by the storm." Here is the Weather Modification Treaty for Canada and the United States . This is from the Canadian Government website. The treaty is from 1975, 42 years ago. To think there is no weather modification is absurd . There are reams of patents related to weather modification equipment. It is called Geo Engineering , and it is no conspiracy theory. What are weather modification activities? A vast subject to explain in the comment section. You will have to do some research. Check out What in the world are they spraying on YouTube. Check out David Keith from Calgary , now at Harvard. There is a plethora of information out there, all denied by government and media. Also quite hilarious is the new movie GeoStorm portrays this technology as fictional ..
You provided a legitimate link to a government web site that posted a treaty between Canada and the US stating that both parties agree to notify the other party when they engage in weather modification activities. That in itself is an admission that both parties actually do participate in weather modification activities. Yes , and 42 years ago . Just imagine where they are now in the age of high technology. There is also a international treaty at the UNITED Nations website. Incredibly still looked upon as conspiracy theory. You should research this subject and post some info for the sheep.